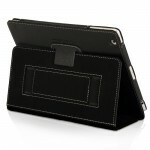 The Snugg iPad 2 Executive Case and Stand in PU Leather is exactly what it’s long title suggests. It is an iPad case! It is generally known that iPad cases for iPad 2, iPad 3, or iPad 4 will fit with iPad 2, iPad 3 or iPad 4 interchangeably but if you are still worried that the iPad 2 Executive case won’t fit your iPad 4, don’t worry, Snugg sells the iPad 4 executive case. It’s the same case but if you’re ODD about it, Snugg has got you covered (which is okay, I get that way too sometimes). Anyways, the Executive case is available from Snugg for $39.99 direct. Let’s see if it can match it’s five star brother. 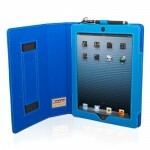 The form of the case is very similar to it’s sibling that I reviewed earlier, the Snugg iPad 4 case. It has the same nice stitching, the same out of the way features such as the stylus holder and the strap. The front has the same out of the way branding and bifold. The inside is even nicer in this case than the other Snugg case. There are a few differences in the two cases, however. First, the feel of this case isn’t as soft as the other Snugg case I reviewed. Despite that, the case is very comfortable and it feels like it is still very sturdy, just as the other case is. Another difference is that this case has another cool feature that the other regular case did not have. This case has four really nice pockets built in. One is for bigger things such as paper, money, paper pad, pencils, pens etc. The other three pockets are for pens, slips of paper such as business cards, pencils and any other little object that fits. The pockets again are out of your way and are really useful when you use them. Once again, the form of a Snugg case aces. The case, like it’s sibling that I reviewed, is very good at protecting the iPad. It keeps the iPad snug inside while preventing it from breaking when dropped. It does a great job keeping it from getting scratches, big or small. 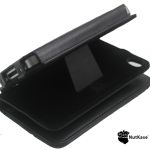 The case, again like it’s equivalent, has a sturdy stand and puts the iPad at both a comfortable ergonomically correct typing angle and a comfortable widescreen, landscape view. The strap, again, is very handy and I really like the ability to carry the iPad around with one hand comfortably. 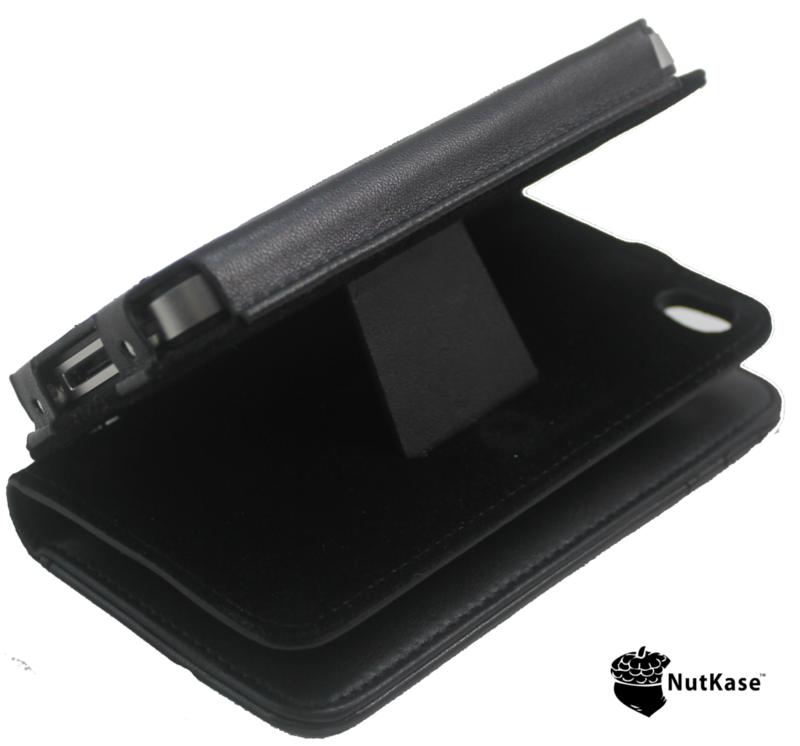 The additional feature of the case, the added pockets really do come in handy and I’m sure that businessmen and women really appreciate this added feature, as well as doctors, lawyers and other professionals. The pockets do go a long way especially when you use them a lot. It adds a business side to the iPad case while still keeping it practical and light. -For the third time, there is nothing that fits this category. Snugg has really delivered. They sent me three cases to review, two of the last case I reviewed and this one and all three are excellent cases. I mentioned in my last Snugg case review that I had used a Snugg case for a year or so. I will continue to use Snugg cases for as long as the ones I have received last and once they fall apart, if I don’t find an even better case than this, I will buy another. As with my last case, it is still at work, providing the same protection it provided me for my iPad now for my friend’s iPad and I expect it to last awhile longer. Great job Snugg on all the cases you sent me, keep doing what you’re doing, it’s working well. 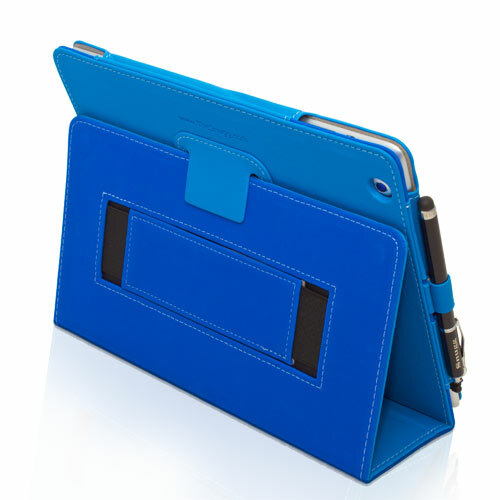 Here we have the iPad 4 Case Cover and Flip Stand in Blue PU Leather available from Snugg for $34.99. The case is actually the successor to a case that I used for my iPad 2 from when I first got the iPad 2 in 2011 until just recently. The case has changed for the better. Let’s see if it’s the iPad case for you for the price. For starters, before we even open the the case, it has a very nice feel to it. It feels soft to the touch even though it would protect it in a fall. The front of the case, of course, features the brand very cleanly and out of the way. From the get go, you can tell the case has a bi-fold, which I think tend to be better than tri-fold cases because of it being more easier to manage. The stitching also looks as though it was well done, just as your grandma would have it on the best sweater she ever made. It doesn’t have any loose ends and appears to be complete (I can’t say the same about the last iPad 2 case I had). Moving on to the back, you have a little fold that holds the cover to use as a stand, we’ll discuss that in a little more detail in the Function paragraph. Of course, that piece also has very well done stitching. There is a hole for the camera which does it’s job and nothing else, just as a camera hole should. When you open up the case, you have a left part, a center part, and a right part. The left part has a handle, held in nicely by an elastic material. It is useful should you want to hold it by one hand. The middle part is actually very important because it either lifts up the iPad when in typing stand mode (landscape), or it will be the stand that stands up the iPad in portrait stand mode. In addition, you have the right side which is the part that holds the iPad, which makes the appropriate cuts for the camera, home button and volume and brightness switches. All parts, of course, have the wonderfully done stitching, Grandma would be proud. There is one thing I haven’t mentioned yet. The case has a good blue color to it, not dark blue to where it’s almost black and not bright blue where it’s blinding my eyes. It’s just right, at least in my opinion on colors. Overall, the case is made very well. The case is a very well thought-out representation of the brand name, Snugg. The iPad is very “Snugg” inside the case. 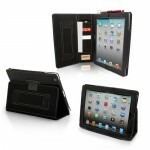 It’s comfortable for the iPad, while protecting against very hard floors that seem to attack it when it’s unprotected. Keep your iPad in the case and it will protect it against any reasonable fall (no, it probably won’t survive a 15 story fall but at that case the fault goes to the user, not the case). The case definitely does it’s job in it’s primary target. The stand also is very strong. The stand can be used for a typing angle or a watching a movie/widescreen view angle. It holds up no matter the surface, which is good considering that it is on my lap sometimes and I don’t want the stand un-standing when I am using it, unless of course I “un-stand” it. The strap that allows you to strap the case (and the iPad for that matter) to your hand is very functional. If you can’t hold it, strap it. Of course, you must have it standing upright and not down to your side for it to work, or it might slide off your hand. Of course, any practical person would not do this anyway so it is understood that this is not the case’s fault. There is one neat feature about this case that I like. If you own a stylus, which I do, you can attach it to the top of your iPad onto a tab that comes out of the case that folds in when not in use. Therefore, if you don’t use it, keep it tugged in and it won’t get in your way. Also, even if it’s not tugged in, it won’t get in your way. If you don’t own a stylus, it will fit a pen too. There is a beauty to the case, it’s simple and nothing gets in your way. If you don’t want to use the extra strap to strap it to your hand or you don’t want to use the stylus/pen holder, you can tuck it away while still being there anytime you want it to be. They are hidden but still there. Overall, the case excels in this category. I have had a very positive experience with Snugg. I have owned their previous iPad 2 case and it lasted me more than a year, and it would have lasted me more than that had I not given it away to a friend recently (he is enjoying it throughly). It beats out the case that I have been using and it will last me a long time. I know that the case will protect my iPad for another year or hopefully longer this time. This case is a very nice case and it will serve you well. As you read above, I have nothing but good things to say about this case, therefore it is easily given 5 stars. Plus, it’s $34.99, which I think is a great price for this case. Great job Snugg on this awesome case! The Genuine Leather iPhone Wallet is exactly what you would guess it would be, a leather wallet that houses your iPhone inside. The wallet is available from NutKase for $34.99 direct. 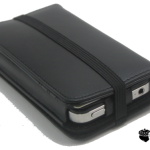 It is a great iPhone wallet and a must have for anyone who wants to put two of their going out must-haves into one. Let’s find out if it is best for you. The first thing that struck me about the wallet is that it is made out of very nice leather and it looked like it truly was genuine leather. According to Nutkase, it IS genuine leather. That is a huge plus in the Form category because that means it doesn’t get damaged very easily and it will not fall apart like fake leather tends to do after a while. The wallet comes in black or red leather, both are very good looking colors, at least in my opinion. Something that struck me about the wallet, before even getting into the it, is that there is no zipper. The wallet is held close by a strap or a magnet (this depends on whether you get the black or red model respectively) that binds the two sides of the bifold. It actually is a great idea to use this strap instead of a zipper, because after awhile zippers fall apart, they break after a short amount of time. The strap, however, dangles and becomes a nuisance when using the iPhone, it dangles on your hand and it becomes annoying. On the back, you’ll notice the cool Nutkase logo which is an acorn with a bite into it, like the bite in the Apple logo. Another thing you’ll notice is the hole one the top left for the camera, so you don’t have to take the iPhone out of the wallet to take a picture. Another thing you’ll notice when it is closed is that it’s lengthwise exact to an iPhone 4 and 4S so as a wallet it is a little awkward but once you use it for a little while, you’ll get used to it. The form makes it that you can’t put a dollar in longways, you have to fold it, but that is okay anyway since most cashiers like to give you cash back folded. Of course, if you could put a dollar in it longways, it would be a very awkward wallet so it is better actually that you just fold it. Going inside the wallet is two parts, made out of genuine leather of course. There are three pockets, one for ID and two for any cards you have. Also behind these pockets is the cash pocket to store folded cash. On the right, there is the iPhone holder which, you probably guessed, holds your iPhone. Behind this, is a part that comes down, unveiling a little stand so that it can stand on your desk or a flat surface while you watch a video. Also, I’ve noticed the stitching on the product is very well done and it should be known that the product is made in Italy, which is known for it’s great leather, which this product is made out of. Out of all the leather cases I have seen, this one steals the show, it is very nice. 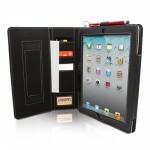 Of course, the function of the case is very important which this product delivers in as well. The fact that you cant put bills in long ways is a downside but it would make the wallet really awkward so it is a trade-off. If I’ve used case instead of wallet throughout the review, that’s for a reason. The leather wallet is also a case. It does a fairly good job at protecting the iPhone and I would feel safe with my iPhone in it. It is big enough to fit enough stuff in it, but not too big where it’s awkward and doesn’t fit in my pocket. It’s a great size. Another feature that I like a lot about the case is the stand, allowing you to watch videos or what not on it without holding it. In order for the the other side to not get in the way, you can fold it back. This makes it that one of the sides doesn’t get in the way of the viewing experience. However, the stand may not work as well if you have stuff inside that other side, such as cards or coins. It can make it bumpy which would cause it to not be as straight as it would be if there was nothing in it. That is not a huge problem and can not really be controlled, just be aware of it. I’m just glad they added the stand, it is a nice feature, unique to even standalone cases. The wallet is held by a strap which holds the two parts of the bifold together so the wallet will stay closed when you want it to stay closed. Also, the red wallet is not held by a strap but a magnet. I am more of a fan of the strap since a magnetic connection can always be broken. Like I mentioned before, there is an annoyance with the strap but it generally works well. It just is annoying. However, despite the few flaws it has, this case is a solid piece of work, well worth it’s price. As you can see, there are many pros and few cons. That’s for a reason. The wallet does a great job at many things and a not-so-good job at a few things. There is always improvement to be done in products but this wallet did exceptionally well. It’s a wallet, a case, a stand and it’s in genuine leather. What else can you want in an iPhone case/wallet? The ideas are great, and most are executed very well. 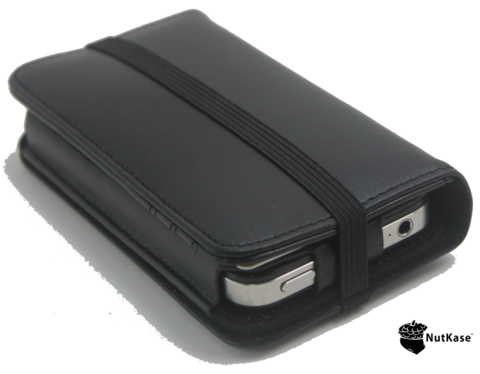 A few can be improved therefore it is with that the NutKase Genuine Leather iPhone Wallet receives 4 and a half stars. Great job NutKase, you did exceptionally well with this wallet, the first iPhone wallet I’ve seen and I’m glad that I did see it.